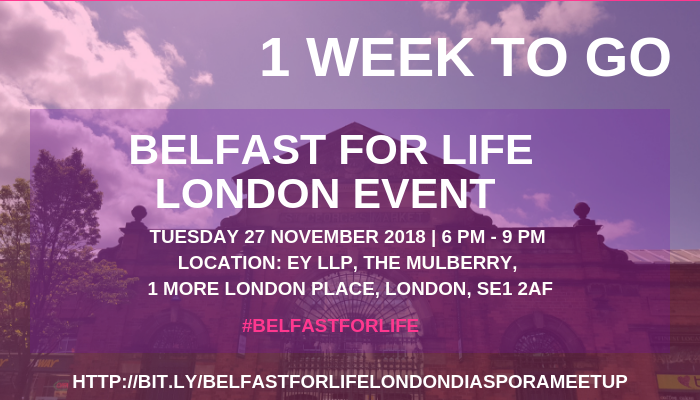 Only one week to go until our Belfast for Life Diaspora Meet Up in London. Sponsored by EY the event will be taking place in the Mulberry Restaurant, at 1 More place, London. 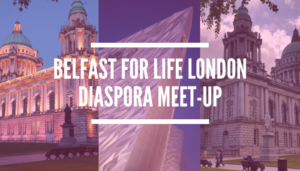 ‘Belfast for Life’ is an international networking initiative aimed at connecting the Northern Ireland diaspora community across the world. We want to spread the word that despite current challenges, Belfast is thriving with optimism, investment and opportunity. The city is uniquely positioned to offer fantastic lifestyle and culture, as well as superb career development. Don’t miss this opportunity to keep in touch and to make new friends and contacts. Opportunities to network with representatives from EY, the Northern Irish Tech Industry, and Visit Belfast. Sarah is the Ambassador Programme Manager at Visit Belfast, the Ambassador Programme is a network of leading professionals who support Visit Belfast in promoting the city as a conference, meetings and events destination. Business Tourism is big business in Belfast. In the last year alone Visit Belfast secured 76 conferences for Belfast which will generate over £45m to the local economy. Attracting conferences, meetings and business events to Belfast and Northern Ireland not only generate tourism revenue, but also deliver in the longer term. Showcasing the region as an attractive place to visit, meet, work and do business enhance our international profile and helps secure investment which creates and sustains jobs. Ruth Logan is Assurance Partner, specialising in External Audit and also leads the Audit team in EY’s UK & Ireland Delivery & Innovation Centre based in their Belfast office. She joined EY in 2009 and relocated to Belfast 3 years ago. Having worked with a wide variety of global clients throughout her career and she has experience with manufacturing/distribution, retail, private equity, chemical/building products and travel. Victoria McCallum is a blow in to Belfast, unexpectedly moving for the craic 11 years ago. She currently works as an independent IT contractor; leads the Lean In Belfast Women in Tech network; and is a non-exec director of a couple of local charities. Victoria will wax lyrical about the booming NI tech industry and its various opportunities; the numerous networks within the very supportive local tech community; and why she’s committed to Belfast for the long haul. 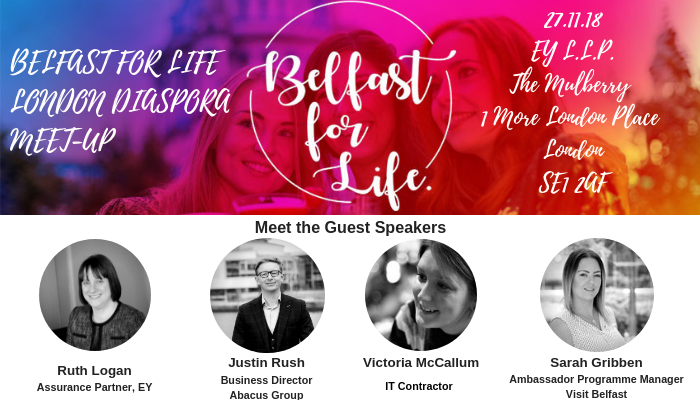 Justin Rush will introduce the speakers and touch on the developing market for those wishing to bring their talent back to Belfast for life! Anyone looking for opportunities in Northern Ireland, People from N.I. living in London who wants to connect with the local diaspora and those who are interested in relocating to N.I for a better work-life balance than they are finding in London. Please tell us why you are attending the event so that we can make sure you get to talk to the right people at the evening.